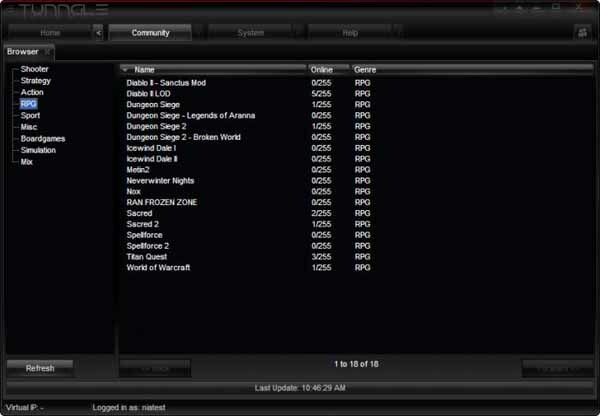 Free download Tunngle Latest Version.Tunngle allows you to easily play your Local Area Network (LAN) games online over the Internet.This means that, when you run Tunngle, you can use the Local Network Menu of your games to play your favorite Multi-Player games on-line. Your favorite online game has been shutdown? No worries, Tunngle gives your game an extra life thanks to its powerful Local Area Network emulator! Just join the proper network, launch the game and resume playing your favorite game over our Virtual LAN! Playing games is no longer restricted only to one’s computer, as more and more users from all over the world like to play against each other over the Internet or within the same network, with their friends. Those who want to be able to enjoy their LAN games with people from the other side of the world can try Tunngle, a specialized VPN tool. Tunngle redefined the VPN technology industry standards. Its huge 255 players Virtual Networks are the ideal place to play games over the Internet but they can also be used for a range of professional IP-Based applications as never before.